The Heart Foundations of Shamanism series offers one gathering each season, open to people of all experience levels on their spiritual paths. Each seasonal gathering has a guiding theme & inspiration, exploring different aspects of building a strong and sustainable foundation of heart-centered living. You will be provided two nights accommodation at Algonquin Park, Canada. Sleep in the fresh forest air, and rise with the birds as the morning sun lights up your cabin naturally. These wood and canvas structures are clean, dry, and nestled on a hillside surrounded by the lush greenery of the forest at the edge of Algonquin Park. Ladybug Lounge, Loon Echo, and Lily’s Pad boast comfortable feather duvets and colourful linen sheets on bunk beds. The original honeymoon suite, Moonbeam, and its twin Firefly each feature a double bed and are ideal for one person. Some call it glamping or glamorous camping. The best outhouse in Canada is just steps away featuring a tiled floor and composting toilet. Flush toilets and showers are located in Points North, just a one minute walk away. Surrounded by the maple and balsam fir forest, these cabins were designed for year round comfort. These well-insulated buildings are heated and available for year round accommodation. Osprey and Tamarack feature 2 single beds plus a loft with a double bed, topped with feather duvets and colourful linens. Washrooms and showers for these cabins are a short walk to the green-roofed building, Points North. These cabins accommodate two to four guests. Year round eco-accommodations in Algonquin Park, the Studio Cabins feature spacious rooms with many eco-friendly features. Rooms feature a small en-suite bathroom with composting toilet and running water. Tranquility, Balance, Harmony, and Dreamtime are the premium accommodation options. Come home and remember how to live in ceremony, nourish and grow the passions that give you great fulfillment and connect with inner wisdom to help guide your purposeful journey. The Heart Foundations of Shamanism series offers one gathering each season, open to participants of all experience levels on their spiritual paths. Each seasonal gathering has a guiding theme and inspiration, exploring different aspects of building a strong and sustainable foundation of heart-centered living. 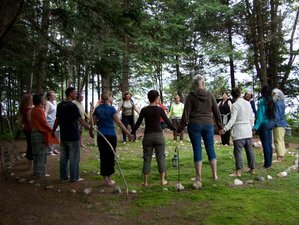 Each retreats program is co-created with participants through a process you call the way of the circle. Participants tap into their intuition, unique gifts, soul yearnings, day and nighttime dreams, ancestral wisdom, and helping spirits to co-create living ceremony, going deeper into rediscovering their greatest teacher and healer within.This allows you each to receive a magical learning experience that meets your individual needs while being of service to the greater circle. Through the heart’s gateway within, you are able to respond with your innate gifts and abilities, fulfilling the greatest needs you see in the world around you. Step outside to daydream in nature, honouring your ability to create in this time of abundance. Algonquin Park is often referred to as the Gem of the Ontario Parks system. Ontario’s oldest and largest provincial park, Algonquin is often thought of as a National Park - perhaps owing to its original name - Algonquin National Park of Ontario (est. 1893). In survey after survey, Algonquin Park is continually listed 2nd (behind only Banff National Park) as Canadians' Most Priceless National Park. Each year Algonquin Park hosts over 800 000 visitors. Most visitors stick to Algonquin Parks Highway 60 corridor and check out the visitor centre or hike a trail. Guests at Eco-lodges and resorts like Northern Edge Algonquin go off-the-beaten track and discover the magic of Algonquin on 3-4 day all inclusive guided explorer packages. Algonquin Park was originally only accessible by train from Toronto. Today, Algonquin Park is accessible by public transit with Ontario Northland, making this part of Algonquin Park (Access Point 1 - Kawawaymog Lake) accessible from downtown Toronto’s Bay Street station. Learn more about public transit. Sadly, the Northlander Train from Union Station is no longer in service, but their bus service still brings people to the park daily. You will be provided with daily healthy meals. Proudly serving a taste of Northern Edge Algonquin's region, cooking at the Edge focuses on balancing globally far-flung tastes with provincially produced foods. While seasonal menus are inspired by flavors from afar, they seek to prepare your meals with ingredients raised closer to home. Some food ingredients come from their garden, but most come from local gardens and Ontario farms, including a local organic meat provider. Your mealtime experiences at Algonquin Park home will be remembered and treasured by everyone. Your meals take into account specialty food restrictions for health and personal reasons ensuring each individual’s needs are looked after when they deliver a colourful, tasteful buffet style meal. Easily accessible from major centers in eastern Canada and the US, Algonquin Park holds a special place in the heart of many naturalists, canoeists, and backcountry solitude-seekers. Algonquin Park is the natural destination of choice for visitors to Ontario looking to spend quiet time away from the hustle and bustle of the city. Canoeing is the best way to navigate Algonquin Park with over 1500 kilometers of canoe routes that follow lakes, streams, and portage trails throughout the park’s interior. Motor boats are restricted to a few lakes of the larger lakes and road access is only available in the well-travelled Highway 60 corridor. In the winter, Algonquin Park’s backcountry is travelled very little, usually by dog sled. Northern Edge Algonquin sits at the Northwest Algonquin Park Access 1, Kawawaymog Lake, east of South River. In addition to lakefront access to Algonquin Park, and nature exploration opportunities within Algonquin Park, the nearby Forgotten Trails offer a wealth of trail hiking, mountain biking, snowshoeing, and skiing opportunities for the nature enthusiast. Reflexology appointments with Vicki Waters may be available on arrival day prior to program start, or on departure day after the retreat has ended. Please check availability and book this service in advance. Shuttle from South River Bus Stop is available for 32.5 CAD plus HST. Unplug, reconnect, recharge, and re-inspire. A leader in transformational travel, Northern Edge Algonquin creates & hosts all-inclusive nature retreats.